We have been busy studying the Industrial Revolution and learning how the ingenuity of 19th century Americans changed the world forever. Your student took a test on this content last week, but we are extending this unit to include a project on inventions. Each student has chosen an invention to research to understand when it was created, why it came into existence, who invented it, and how it is used today. After a thorough study of their invention, they will write a 1-2 minute speech to present to the class. 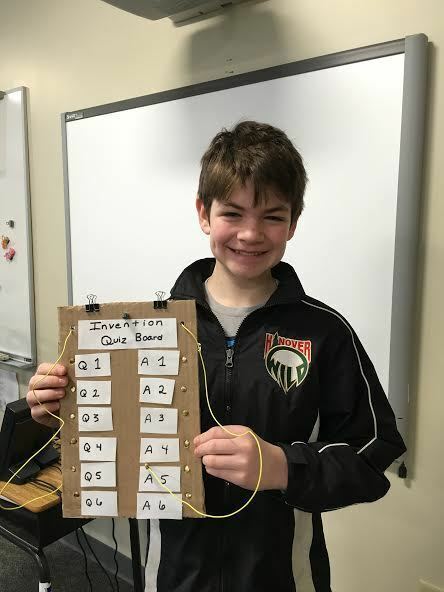 Perhaps the most exciting piece of this assignment, however, is that each student will create their own invention of an electric quiz board. They will choose 6 critical details from their invention speech to quiz their classmates and challenge them to find the correct answers to on the quiz board. Please ask them about their inventions and be ready to take your student’s quiz soon!